Sadly, this doesn't get rid of the Parallax movement affect when scrolling up or down through an iMessage conversation - where the little message 'bubbles' take on a 'floaty' quality and appear to chase one another up or down the screen - but at least it means that I (and you!) can have a pretty, personalised Wallpaper again. How lovely. 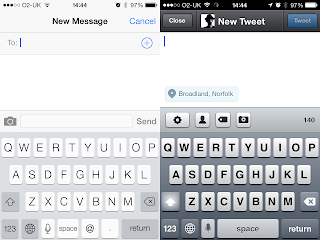 Why the new keyboard in iOS7 only ever displays the letters on the keyboard in capital letters, I don't know. Yes, that makes it more like our computer keyboards, which only have capital letters on the keys, but with iOS7 I sometimes glance down at the screen and panic that I've written a text message or email ALL IN CAPITALS, and will have to start again. The new 'Shift/Caps' button to the left of the Space Bar has also taken on a different style, and I am now finding it difficult to differentiate between 'no caps' 'single caps' and 'caps lock' on the keyboard. The keyboard also seems to respond every-so-slightly slower to typing than it did in iOS6 - which, if you type quickly on your iPhone, does get annoying. 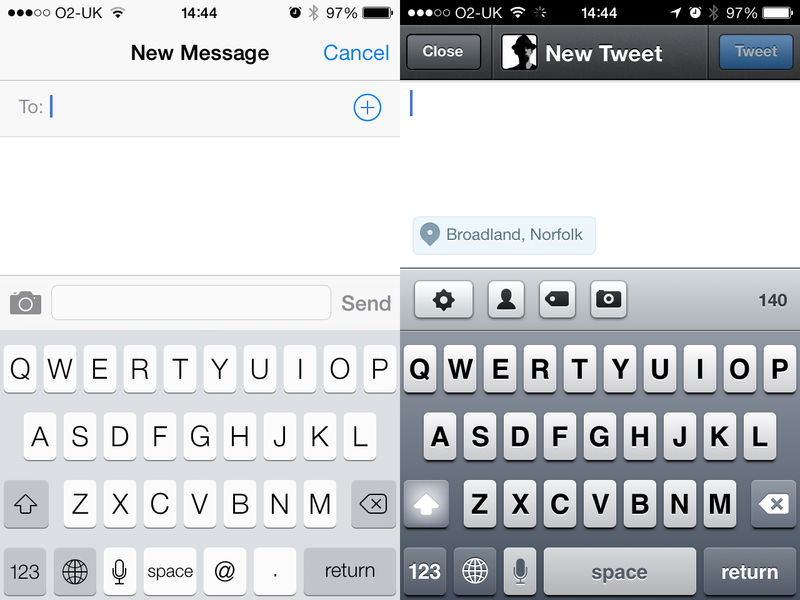 Finally, some apps have the 'new style' iOS7 keyboard, while other apps still have the 'older style' grey version - very weird. Writing a new text message (left)? Use the new keyboard! Writing a new Tweet (right)? Use the old keyboard! Firstly, some background. iOS7 is a much bigger change than any of the previous updates to the iOS platform have been. When I updated from iOS4 to iOS5, and then again from iOS5 to iOS6, the new versions didn't take much 'getting used to' - they were, essentially, the same system. Each new update came with a few minor tweaks, a couple of added features (notably voice-command app Siri, which first appeared with iOS5, and the controversial move away from Google Maps in iOS6), but the overall look and feel of iOS remained fairly constant across the updates. With iOS7, Apple have redesigned large amounts of the way their mobile devices work, and the operating system has a whole new look. The look is bound to be controversial; Apple has opted for bright, bold colors with more clean lines and far fewer textures, shadows and gradients. There is still some depth to the OS, however, with transparency effects giving a sense of background and foreground elements (the dock row is an opaque rectangle through which your home screen wallpaper is visible, for instance). Apple’s visual overhaul received a lot of knee-jerk criticism when it was revealed at WWDC earlier this year, but in practice, the visual changes are actually quite pleasant, and grow on a user with time. Looking back now, iOS 6 feels dated, despite the fact that when I first started using iOS 7 I felt it was inferior in terms of look and feel to the older OS. Apple’s new look with iOS 7 takes acclimating, but on the whole, it’s an improvement. So what do I think of iOS7? Well, I'll tell you; are you sitting comfortably...? Having to rely on a third party app for a torch on your phone has always been a weakness of the iPhone - not any more, as Apple have finally caught up with the Android operating system which have offered this for a while. Thank goodness for that! I like the Control Centre feature - swipe up on your phone's screen for instant access to basic functions, such as changing the screen brightness, or the volume of any music playing, without having to exit your main app. Control Centre also lets you switch on/off Aeroplane Mode, BlueTooth and Do Not Disturb Mode without having to go into Settings first, and gives you access to a the torch, the calculator and the camera without having to open them from the Home Screen. Instead of the 'bars' of varying heights, from short to tall, to show how strong your mobile phone signal is (which I always thought looked slightly like the graphs which primary school children make to show how many kids in their class have brown eyes, how many have blues eyes, and how many have blood red eyes like the devil), iOS7 has little circles. The more circles are filled (instead of empty), the better your signal. I actually think they're rather stylish. New Volume control - very nice. The little graphic displayed on the screen when you adjust the volume of the phone using the buttons on the left hand side has been change - I think - for the better. The new 3D tabs in Apple's mobile web browser Safari look very cool, and are a nice update. Folders of apps on your Home Screen are now able to contain more than one page of apps - which, frankly, is a long overdue and very welcome improvement. behind the rest, with 'old style' icons. It has been widely publicised that, in iOS7, Apple have 'flattened' their icons, and moved away from the glossy 'glass' look that has been their signature look since the first iPhone release. Now, I've nothing against the flat icons themselves - but not every app that I use has updated its icon to the new style, so I now have an alarming lack of homogeneity in app icon design on my Home Screen, and for someone like me that is quite disturbing. I mentioned earlier how pleased I was to see that you can now have more than one page of apps within a folder - but one change of which I am not so fond is to the colour of folder background... At first, I thought that the folder backgrounds had been changed to an unpleasant shade of beige, but now it appears that the background takes it colour somehow from the colour palette of your Home Screen wallpaper; either way, it leaves you with a clunky 'splodge' of a folder on the screen. When you go to your Home Screen (either from the Lock Screen, or when closing an app) your app icons aren't just there any more - they have to 'zoom' in to the Home Screen. There's nothing especially wrong with that, but it's just another unnecessary complication. When you press the Lock button (at the top right of your phone), your Lock Screen doesn't just appear any more - it 'fades in' slowly. And then it 'fades out' again when you press the button a second time to turn the screen off again. This only takes a fraction of a second, and isn't a huge inconvenience at all - but how, exactly, is that an improvement on the previous method? Answer: it isn't. iOS6 (left) is personal - iOS7 (right) is bland and generic. 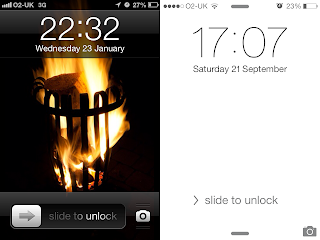 When you're looking at your Lock Screen, the Wallpaper background will 'move around' if you tilt or move the phone. This is intensely irritating - so much so that one day after updating to iOS7, I changed my old Wallpaper (a photo of a blazing fire in my back garden, of which I am rather proud, and which has been my phone Wallpaper for almost two years) to a rather dull plain white background so that the moving wouldn't show up. It feels like my phone has lost its identity. Similar to the above issue - on your Home Screen, the app icons themselves now move ever-so-slightly from side-to-side if you change the angle at which you're holding the phone. Even changing the Wallpaper hasn't fixed this, and I can't find any way to switch it off in Settings - so it would appear that I am stuck with this, even though every time I see it I want to scream. The new interface for mobile iCal is an absolute trainwreck. It is hard to navigate, and adding events to the calendar has been made needlessly clunky and complex. I have a lot of online calendars to manage, and I use my phone all the time to check my availability and keep my schedules up-to-date. This task has just been made a lot more difficult. The only good thing about the new version of Calendar is its new 'flat' icon, which I actually quite like. So there we have it... There are some very good points in iOS7, and there are a few things which either came as a bit of a shock, or which I initially haven't liked, but only because I haven't fully got used to them yet - unfortunately, though, there are also some things which I really hate, and to which I can't see myself becoming accustomed any time soon. Earlier today, I read a piece in Telegraph by Michael Hogan, entitled The 15 Most Annoying Things About iPhones. 1. The new, cheaper iPhone is called the 5C, which sounds like a class at school or a flat above a shop. It comes in four candy-bright colours, like it’s a highlighter pen, pair of Crocs or something. Perhaps the “C” stands for “common”. As it happens, I completely agree with Mr Hogan, here. In the past, iPhones were only available in black or white, and that's how it should be. (Personally, I'd get rid of the white as well.) Having a range of garish colours makes it look like a product for eleven-year-old girls. 2. Its posher sister model, the 5S, has a fingerprint sensor. So thieves won’t just steal your phone, they’ll amputate a finger too, like a sort of telecoms Yakuza. I'm pretty sure you won't be forced to use the fingerprint thingy. 3. They still automatically put “Sent from my iPhone” at the end of emails, making you look like a tragic show-off. You can switch that setting off pretty easily, actually. 4. Smug people with the new handsets will proudly place them on the pub, café or meeting room table when they sit down, then keep sneaking surreptitious glances at them. Oh, right. So the vague possibility of not seeing a text from your mum the very second it arrives is more interesting than anything I have to say, is it? Rude. Nonsense. I take things (my wallet and keys, as well as my phone) out of my pockets when I sit down because it's uncomfortable to sit down with a lot of bulky things in my pockets. And as for whether a text/email I receive is more interesting/important than the people I'm actually with at the time? Well, it may be - but if I don't look at it, I'll never know. The fact is, most texts or emails can be (and usually are) left until later, once I've seen what they are - but if there's some urgent crisis in the family, or an incredible once-in-a-lifetime work opportunity arises, someone will contact me through my phone, and I'll want to know about it. 5. Don’t even get me started on “phubbing” (the phrase or the phenomenon). 6. The first line of incoming texts pings up on the homescreen. So if you do leave your phone on the table, other people can see if you’ve been bitching about them/sexting. Not that we would, naturally. Perish the thought. Again, you can switch this setting off. 7. Those losers who queue up to buy them on the first day of release. It’s just a telephone, chaps (and they always are chaps). Have a serious word with yourselves. This irritates me no end. Not the battery life itself - but people moaning about it. If you use your phone so much that the battery wears down within an hour of leaving the house, for goodness' sake plan ahead and take a charger with you when you go out! I have an iPhone charger which plugs into the power outlet in my car, and I have a spare mains charger which I carry in my bag - very rarely do I find myself so far removed from normal civilisation that I wouldn't be able to find somewhere to plug my phone in within, say, half-an-hour, if I had to. 9. If something goes wrong with it, you have to go to the twattily-named “Genius Bar”. Yes, it is a ridiculous name. But also, if they fix your phone for you, what's the problem? 10. On the keyboard, the voice dictation button is placed right next to the spacebar – ie. the single most used key. Cue accidentally turning on dictation mode, taking a second to realise, then having to cancel it to exit. Teeth-gnashingly tedious. I agree that this is hugely annoying, and a big design flaw. 11. Taking “selfies” (sorry) or using Snapchat makes you look fat and old. Or is that just me? Oh. I've never seen the appeal of Snapchat, personally, and therefore don't use it. If you don't like it, I would encourage you not to use it either. 12. People saying “Damn you, autocorrect!!1! lol” after they make a mistake in a text. A bad workmen blames his iTools. Read it back before you press send, you lazy shiv. Damn you, autocorrect. PROOF-READ YOUR MESSAGES - DON'T BLAME THE PHONE IF YOU FAILED TO PICK UP ON A BASIC ERROR IN YOUR TEXT. 13. Kids playing music out of them on public transport without using headphones. Not only is it antisocial but it’s invariably bad music. I realise this makes me sound like a joyless old fart. People with their keypad tones turned right up is almost as bad. Click click click STOP IT. Again - no arguments here! Turn the bloody noises off, especially when you're in public. 14. They popularised use of words like “sync” and “app”, which are impossible to say out loud without feeling like a prize prat. 15. People boring on and on about them endlessly. Which this piece has probably just done. Oops. I guess I've just contributed to that too.